Riverview Manor residents’ council president Donna Wilson is seen here welcoming people to the home’s Sept. 30 fundraiser in support of the Canadian Breast Cancer Foundation CIBC Run for the Cure. When he’s not organizing activities for Riverview Manor residents, Adam Wicklum is often spearheading fundraising events at the Peterborough long-term care home. Riverview Manor LEA Adam Wicklum, assistant director of care Lori Wallace and her daughter, Zoie, are seen here in front of the finish line after the Run for the Cure event in Peterborough Oct. 2. Most recently, Wicklum, a life enrichment aide (LEA), organized a fundraising drive in support of the Canadian Breast Cancer Foundation CIBC Run for the Cure, which brought in $897. On Sept. 30 he organized a cupcake sale and tea party to raise money for breast cancer research. The LEA designed posters that went on display throughout the home to advertise the bake sale to residents, their families, friends, volunteers, guests, management and staff. Everyone was welcome to attend. Residents and several LEAs baked cupcakes as part of programming before the bake sale. Some staff members and families brought in homemade cupcakes for the sale as well. Fun was also incorporated into the event. Prizes could be won by residents during a balloon-popping activity and another game where residents guessed how many pink candles were in a jar. Helene Williams guessed correctly, with 75 candles. Money was also raised by playing a game where, for a donation, people could guess how many pink jelly beans were in a jar. Residents Dorothy McLeod and Herb Doris correctly guessed 150 and both received special prizes. A 50-50 draw raised $68.50 for the foundation. A donation jar received $121.50 from game tickets, cupcake sales and other proceeds. 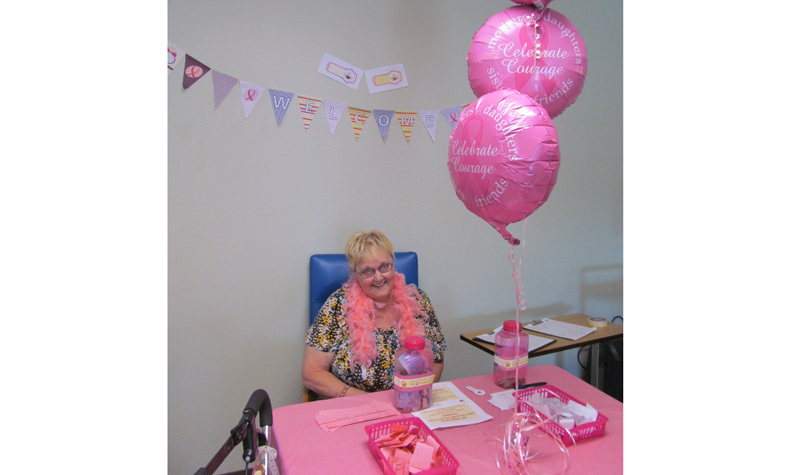 Residents and staff members were encouraged wear pink, the official colour of breast cancer awareness. Pink ribbons were available, and Wicklum says many residents and staff plan to wear the ribbons throughout October, which is breast cancer awareness month. On Oct. 2, Wicklum and assistant director of care Lori Wallace and her daughter, Zoie, walked five kilometres in downtown Peterborough for the Run for the Cure. Wicklum raised $542 and Wallace raised $165. “The funds raised will help fund research that saves and improves the lives of women with breast cancer as well as support services to help all those affect by the disease,” Wicklum says. This year, Wicklum says he walked in honour of a close friend who was recently diagnosed with breast cancer. Wallace walked for a friend and a family member who were recently diagnosed with breast cancer. Wicklum has also organized Movember fundraisers in support of prostate and testicular cancer research each November from 2012 to 2015. He has raised $4,403.